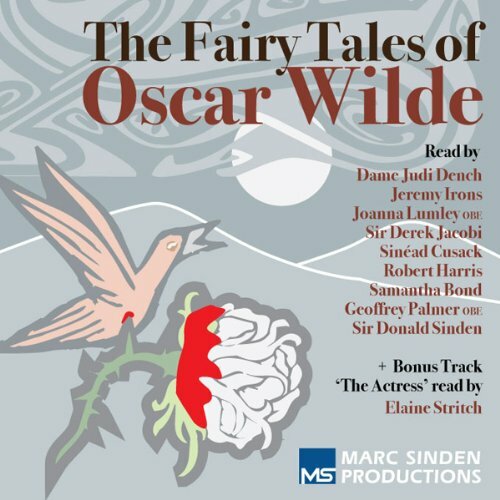 Which is more impressive in this audiobook, the fairy tales of Oscar Wilde or the readings of them by the assembled famous British actors? At their best, Wilde's stories are exquisitely beautiful and painful and reveal deep understanding of the tragedy of the human condition (mortality, inequality, prejudice, selfishness, and hatred), as well as its transcendence through generosity, self-sacrifice, beauty, faith, and love. The readers are perfect, with wise, compassionate, and flexible voices and deep understanding of each word they say and of each scene they depict. Special highlights are Dame Judi Dench reading "The Nightingale and the Rose" so full of wit and emotion, Jeremy Irons reading "The Devoted Friend" with a surprisingly wide range of voices for different characters, Joanna Lumley reading "The Star Child" and moving me to tears, and Robert Harris reading "The Happy Prince" and moving me to tears, too, especially whenever he says, "Swallow, Swallow, little Swallow." Sir Derek Jacobi reading "The Fisherman and His Soul," Sinead Cusack reading "The Birthday of the Infanta," and Sir Donald Sinden reading "The Selfish Giant" all do fine jobs with fine tales. The only dud (forgive the pun) is "The Remarkable Rocket," which, despite Geoffrey Palmer's excellent reading and despite the interesting concept (sentient fireworks talking about their upcoming royal display) is finally a mediocre joke that long overstays its welcome. The only disappointment is that the cover art says that there is a bonus track of "The Actress" read by Elaine Stritch, but it's absent from the audiobook. Anyway, I highly recommend this excellent audiobook. 57 sur 58 personne(s) ont trouvé cet avis utile. So I'll start this review by saying that Oscar Wilde is already the biggest literary influence in my life. There are so many good things about this recording, it will be difficult to enumerate them all. Let me start by praising the voice actors. Their rendering of these stories is very emotional (with the exception of the firework story, that one is good but silly), done with obvious attention to the story that it almost feels like it's something that they wrote for their children. BTW, I wouldn't mind being read stories by Judi Dench every night before I went to sleep. My favorite, and always has been, is The Happy Prince. I swear to God I cry every single time I read it anyways, and the audio of it had me almost crying in my office. UGH so good. Some stories were new, others were old favorites, but all of it was just perfect. Everybody should own this/ be sharing these stories with everyone. Also a very good cause. You have literally no reason not to own this. Audible does not list out each separate story in this collection so I can not simply play the one story I like but must skip or search through this book. There is no table of contents or identification of specific story, narrator, etc. This is a huge drawback. 62 sur 67 personne(s) ont trouvé cet avis utile. It was delightful to listen to O. Wilde's fairy tales. Just look at the list of the narrators. They are virtuosos! I'm glad I bought the audiobook. It is a gem of my collection. Listening to the fairy tales was a captivating experience. The different readers all bring something wonderful to Wilde's short stories. Judi Dench's reading of The Nightingale and the Rose is a particular stand-out performance. This collection is well worth buying, and will be one which can be heard again and again, and again and again. Wilde's strories never age and remain timeless, meaningful and poignant. Don't hesitate to buy this collection, even for a moment. One of the BEST performances ever! Would you listen to Fairy Tales of Oscar Wilde again? Why? This collection was great- while there were some stories that I considered skipping, as I was not a fan in print, the performances made each story worthwhile. A slight drawback is that the collection does not give the name of the performer with the title of each story- I would love to give each actor praise where it's due, but I only recognize the voice of Dame Judi Dench- and it is to her performances that I am writing to praise specificly. What was one of the most memorable moments of Fairy Tales of Oscar Wilde? Judi Dench's performance in The Nightingale and the Rose and, more importantly, The Young King is almost impossible for me to critique- I can find no flaws in her performance and her voice is moving and heartfelt.The Young King though...that's a story I had never read and to hear Ms. Dench perform it moved me utterly. Her depiction of the characters Death and Avarice is both chilling and enthralling- worth every penny of the purchase price for this performace alone. This is a collection that should be shared with select friends, or listened to alone and kept near and dear. These stories are sometimes difficult to listen to, particularly as we are socialized these days to expect a happy ending from our entertainment. However, if you stick with it through a few, they act as somewhat of a mental palette cleanser, and help provide a fresh perspective on other stories and events. Cuts to the heart, effortlessly. I found these stories to be refreshingly brutal. Perhaps it's a misconception that such stories should have a happy ending. Sad sad endings are far more satisfying and meaningful. Read it to your children by all means, they will thank you. I remember when I was a kid The Happy Prince was my least favourite fairy tale. It is just so bleak and depressing. This audiobook provided my first experience of Oscar Wilde's other fairy tales and yep, bleak and depressing is the theme for all of them. I don't think there's one with a happy ending. It got a bit much by the end of the book, frankly. Of course, the writing is exquisite and the pairings of some of the narrators - most especially Judy Dench, Joanna Lumley and Jeremy Irons - was divine. But after the first few beautiful but awful stories I found myself growing very impatient to get to the end of the collection. As wonderful as the prose it, it doesn't provide for a pleasant experience. I actually found The Happy Prince to be one of the LEAST depressing stories, and that is saying something. I beg of you to get this collection and version of these short stories. The readers are magnificent and each story either brought me to tears or brought some intense emotion out of me. I’ve already found theses fairy tales in book form to read and re-read, again and again! !